The evolving demands of customers in the kitchen have prompted manufacturers to develop all sorts of kitchen utensils. Depending on the needs of its owners, all of this equipment are designed to perform specific functions. With their help, users can complete kitchen-related tasks without any hindrance. One such viable cutting tool is a fillet knife which is specially crafted to assist people while filleting fish. Also known as filleting knife, it can be used in almost any kind of surroundings. When some customers use it in their personal kitchen, others normally rely on the fish knife in a commercial business. The basic reason behind such a staggering popularity of this tool lies in its detailed manufacturing. With its sharp blade and ability to cut underneath the fish’s skin without any hindrance, people normally opt for this tool when it comes to chop/cut a fish. When it comes to a fish knife, its primary function is to remove tantalizing meats from the bones of the fish. Since such kind of work requires extreme precision, customers should look for a knife which has a long, thin blade. Talking about one such product, have a look at the DALSTRONG Fillet Knife. It features a 6’’ long blade with a thickness of 2mm. This knife is made of high-carbon stainless steel which, apart from enhancing the lifespan of this product, helps to retain its sharpness for a considerable duration of time. You can use this knife for de-boning, preparing, skinning and trimming meats. Coming towards the weight of this product, it is an extremely lightweight product by all means. But having said that, this is still a strong enough cutting tool which can go through all those bones without any hindrance. When not in use, you can place this knife in a sheath which comes integrated with a pin and string locking mechanism. And as common with almost all the DALSTRONG Products, this fillet knife is covered with a lifetime warranty. One minor drawback which can be associated with this product is that it isn’t a very flexible knife. It is fairly stiff which one can deduce from the overall length of this tool. Featuring a sturdy material of construction, the DALSTRONG Fillet Knife can be your favorite cutting tool for years to come. This knife comes with a special G-10 handle which makes it easy to control in almost any kind of weather. Combine it with the lifetime warranty and this product is certainly worth a try. 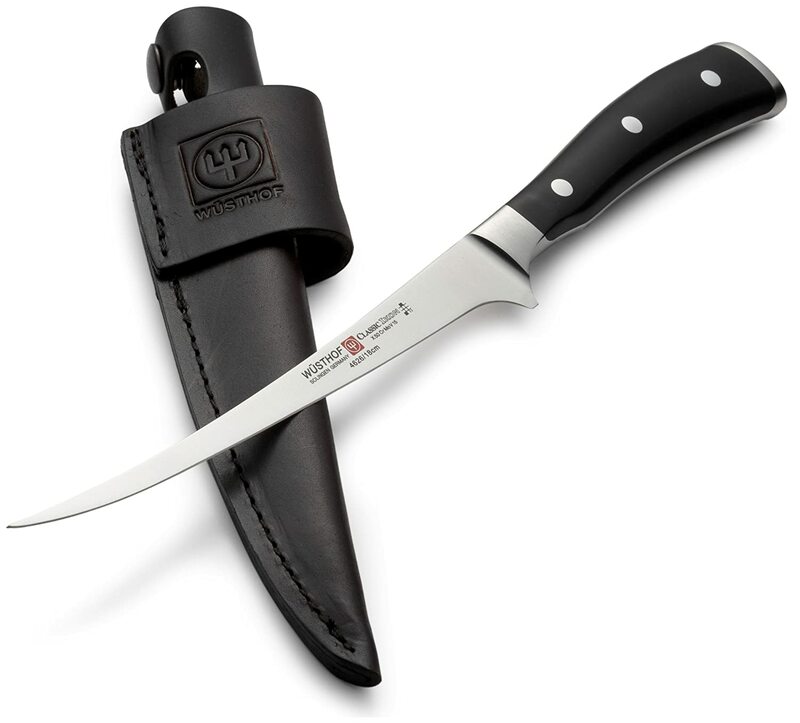 Wusthof is a famous knife manufacturer which has been involved in this business ever since 1814. With more than 2 centuries of experience, this brand knows how to manufacture high-quality knives. The Classic Ikon 7-Inch Fillet Knife is a famous product from this German manufacturer which has been introduced for the fans of fish chopping/cutting. Made in Solingen, this product comes with a flexible blade which is a bit more than 7 inches in length. It is made of high carbon German steel and its handle is specially contoured which makes it easy to grip for a hassle-free cutting. For enhanced durability, the steel spreads all the way, from the blade onto the handle which makes this knife full tang. Apart from providing a decent control over the knife’s movement, this construction prevents this knife from breakage. Coming towards the edge of this knife, it manages to keep its sharpness for a long duration of time. You can use it knife wherever you want, ranging from kitchen to outdoor endeavors and this tool will come up with flawless results. And for the ease of transportation, Wusthof are offering a premium quality leather sheath along with the Classic Ikon 7-Inch Fillet. Onto the minor glitches. For the budget-oriented customers, the Classic Ikon 7-Inch fillet is a bit pricier as compared to other Fillet knives. Even though this does replicate in the premium quality of this product, it might be a bit too much for the budget shoppers. The Wusthof Classic Ikon 7-Inch Fillet will be a valuable addition to any kitchen. Coming from a trusted German manufacturer, this product has got all the features which people normally expect from Wusthof. A full tang construction followed by a 7-inch long blade, it is quite easy to grab this knife thanks to its efficient handle. So all in all, this is the best fillet knife which can serve your needs. The KitchenAid KKFTRFLWM Professional Series 7’’ Flexible Fillet Knife features premium quality German Stainless Steel along with a triple rivet handle. It has a flexible blade which assists users while cutting a fish or preparing a fish fillet. The blade of this knife is made of a non-staining German Steel that works extremely well when it comes to resisting corrosion. This blade is specially hardened and tempered which means that as compared to other such fillet knives, this knife will retain its sharpness for a much greater duration of time. In addition, such a robust construction prevents the blade from breaking for a consistent duration. The KitchenAid 7’’ Flexible Fillet Knife has an ergonomic handle as the manufacturer has employed non-porous fiberglass while crafting the grip of this cutting tool. Apart from sticking well to your hands, the use of fiberglass imparts an enhanced durability to the overall lifespan of this product. And if you’re still in two minds regarding the quality of this purchase, the manufacturer is offering it with a limited lifetime warranty. In contrast to other fillet knives, which comes packed in a sheath, this one can be purchased with a stylish designer box. This box is equipped with magnetic closure so once you close it, the knife won’t come out for as long as you want. Having said that, the overall length of this knife might make it a bit too big for people with small hands. Moreover, this is just a basic fillet knife which is devoid of all the extra gimmicks which you could have a bit expensive cutting tools. Available at a reasonable price, the Kitchen Aid 7’’ Flexible Fillet knife holds decent value for money when it comes to performing fish-related tasks. You can use it for filleting, cutting/chopping and finally, for preparing fillet meat. The Zhen Japanese VG-10 Fish Fillet Knife features a super-sharp blade which is made of VG-10 Japanese Stainless Steel. This is basically the top grade Japanese Steel which has been employed in this product to provide a useful fusion of performance and durability. It has a cutting core with 67-layer of Damascus steel, along with 33 layers on each side of this core which makes it a viable cutting tool for both left-handed as well as right-handed users. The total length of the blade of this knife is 8 inches which have a thickness of 2.5mm. With such a thickness, this knife can perform a wide variety of kitchen tasks involving meats and vegetables. However, you shouldn’t use this knife for chopping bones as it isn’t designed for this particular purpose. The ZHEN VG-10 comes with a PAKKAWOOD handle which keeps it from slipping. It also has a minimal weight so that almost everyone can use it in the kitchen without any hesitation. The price is quite reasonable as well and when it has a full tang design, you don’t have to worry about the durability of this product. This isn’t a flexible knife by any means. As a result, you cannot expect it to perform delicate tasks such a filleting smaller fish. If you’re looking for a decent quality knife to use in your kitchen, the ZHEN Japanese VG-10 Fillet Knife is worth a shot. With a relatively large blade as compared to other fillet knives, it has an optimal thickness for cutting, chopping and slicing meats and vegetables. 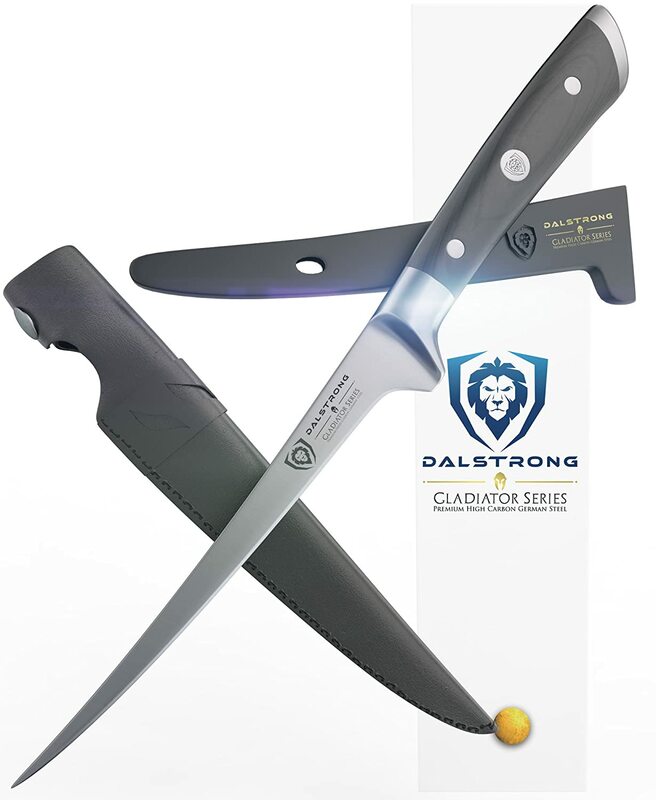 A famous addition to the Gladiator Series of DALSTRONG, this fillet knife features a 7’’ long flexible blade which is of great value when it comes to de-boning, de-filleting, de-scaling along with a handful of other tasks. It is made of high-quality carbon steel which is specially imported from Germany. Such kind of construction makes this tool wear-resistant as you can use it for a considerable duration of time. The best fish fillet knife incorporates no less than 1.5mm thick blade so that you can cut through all those bones without any problem. The overall weight of this product is just under 3 ounces which make it easy to carry from one place to the other. On purchasing this knife, users will get a couple of sheaths for absolutely free. The first sheath is made of a BPA free MOC which is specifically designed for the newbie users. The 2nd sheath is made of leather and when it comes integrated with a belt loop, professional users can keep their knife up close while keeping it inside this particular cover. 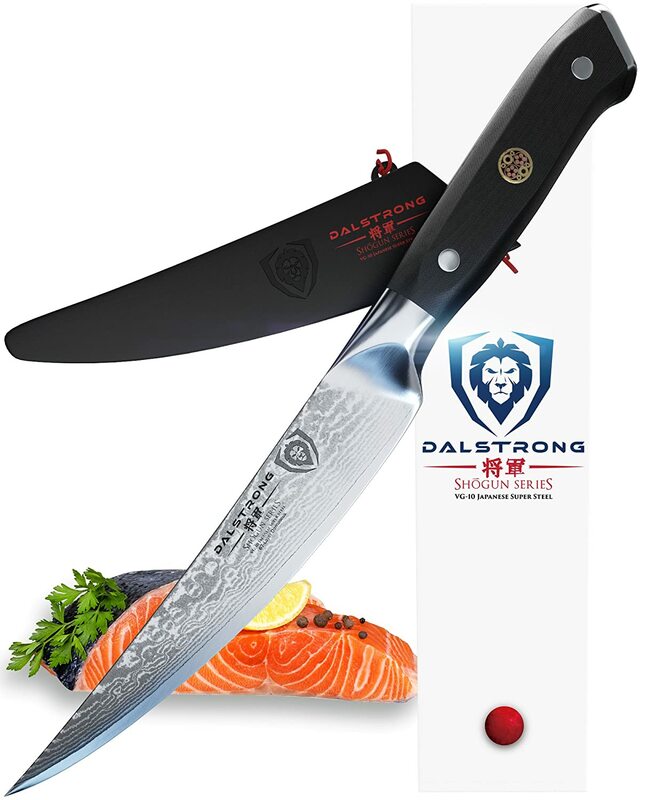 Moreover, you will also get DALSTRONG’s famous lifetime warranty on purchasing this product which is a further proof of the quality of this fillet knife. Finally, it is also quite easy to clean this tool as you just have to soak it with soapy water before drying it up with the help of a towel. One thing which customers have to keep in mind regarding this particular purchase is when the DALSTRONG Fillet Knife performs so well for fish cutting, it does lag a bit when it comes to general meat cutting. 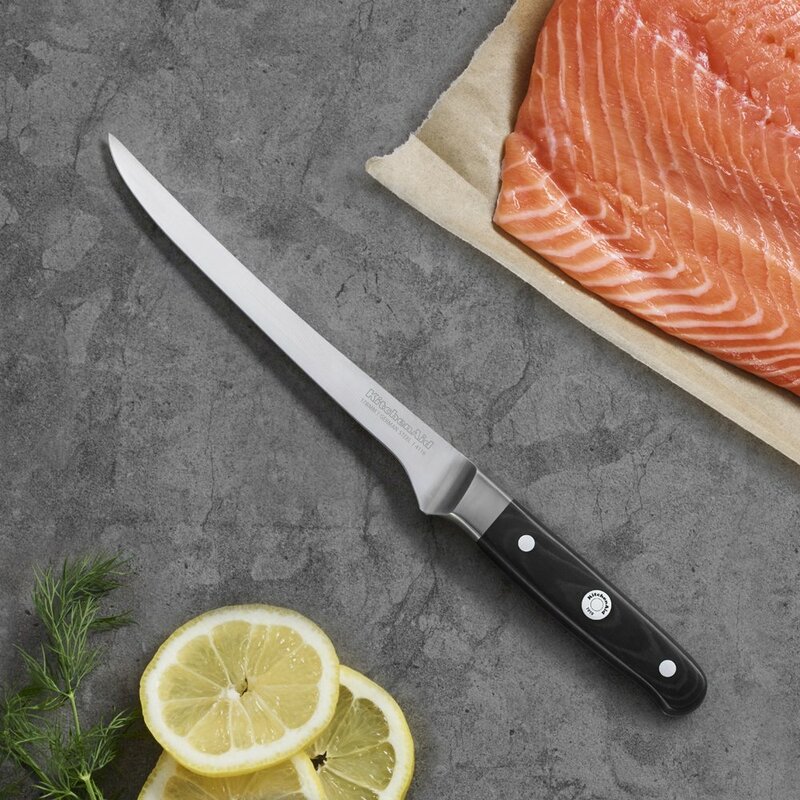 If you’re looking for a knife for chopping/cutting a fish, there aren’t much better products available in the market than the DALSTRONG Fillet Knife – 7’’ Flexible. With a razor sharp blade along with a sturdy material of construction, you also don’t have to worry about the durability of this knife thanks to its lifetime warranty. Another good fillet knife for fish comes from a company which is one of the oldest cutlery manufacturers in the entire world. The FOUR Star is a popular series from Zwilling which was first introduced way back in 2016. Ever since more than 30 million products from this series have been sold worldwide. The 7-Inch High Carbon Stainless-Steel Fillet Knife is a yet another popular product which has impressed a wide range of customers ever since its arrival in the knife-market. As evident from the name of this product, it consists of a 7-inch long blade which is perfect for a series of cutting tasks. You can use it for trimming tenderloins or even cutting through tuna loin and this knife won’t hesitate one bit. One thing which we liked the most about this particular knife is the use of ice-hardening mechanism while crafting its blade. Basically, it makes the blade extremely resistant to corrosion so that one can use this product for an extended duration. Moreover, the blade’s material of construction is high carbon steel which is impervious to the formation of stains. The handle of this knife is made of polypropylene which makes it comfortable to hold. For the ease of cleaning, this knife is dishwasher safe. However, hand washing is recommended for a thorough cleaning. This fish knife comes with a lifetime guarantee which makes it an eye-catching purchase even for the professional users. However, when most of the other products in this list comes included with a sheath, there is no such item included in this purchase. Zwilling J.A. Henckels Twin Four Star 7-Inch High Carbon Stainless-Steel Fillet Knife boasts a useful fusion of style, performance, and durability. With a 7-inch long blade which is made of a stain-free steel, it has a sturdy handle for a comfortable grip. So whether you’re a household user or one looking to make this purchase for an outdoor business, this is a good fillet knife without any 2nd thought. Made in Japan, the Global G-18 Flexible Fillet Knife incorporates wider blades as compared to the majority of other such products in the knife marketplace. It is a decent cutting tool for filleting heavy fish, such as tuna and preparing almost all of your favorite meats including beef as well as ostrich. This knife comes with flexible blades so that you can use it for filleting entire fish or for removing the delicate skin under the bones of fish. As compared a knife with fixed blade, this one makes it considerably convenient to perform any of the aforesaid tasks without wasting any time. The overall length of this blade is 24 cm and when it is quite thin, it helps the owner of this tool for optimal cutting. Coming towards its hollow handle, it is specifically integrated with dark dimples in order to assist the user while holding this knife. The manufacturer has employed CROMOVA 18 Stainless Steel along with 18% blend of Chromium in the construction of this knife which makes it excellently resistant towards different types of stain. Another thing which is quite impressive about its knife is its weight. Having an overall weight of just less than 5 ounces, you can forget about hand fatigue while holding this knife. That said, the price of this knife can be a discouraging factor for some customers. As compared to most of the products in this list, this lies on the upper end of the price list. The Global G-18 Flexible Fillet Knife has got all the features which one could expect from a high-quality fillet knife. With a flexible, thin blade, this knife consists of a sharp blade for an effortless filleting. And when it has a decent length, you won’t have any problem while carving out all the meat from the fish. 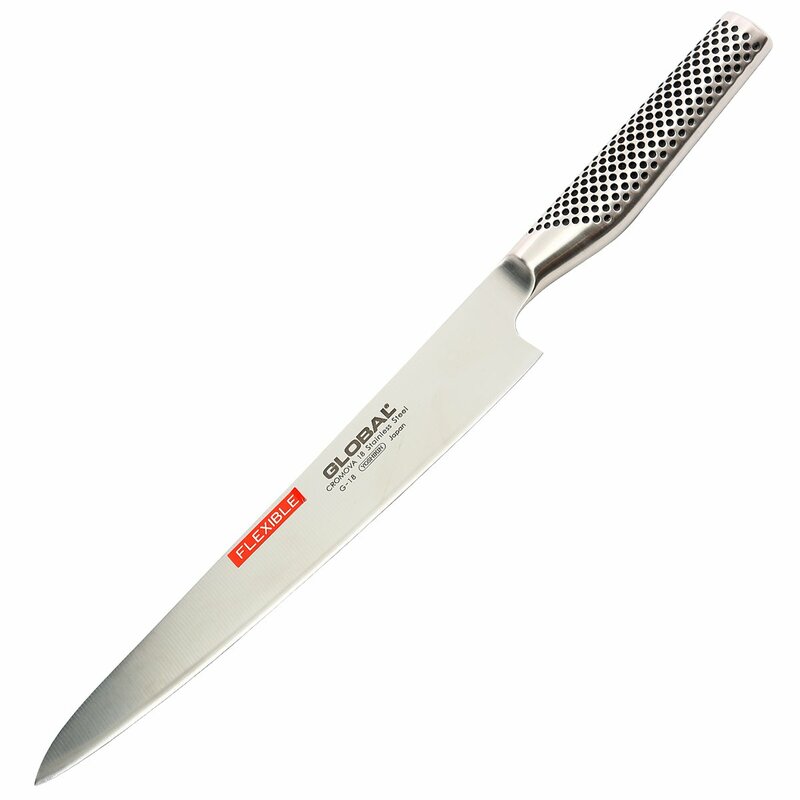 For many chefs, Global G-18 is clearly the best fillet knife for fish and meat. According to American Angler, all their products are created by none other than the fishermen itself. With their help, the company tries to craft such kind of product which can serve the needs of its customers in an imperious manner and that’s exactly what they’ve done with this particular knife. 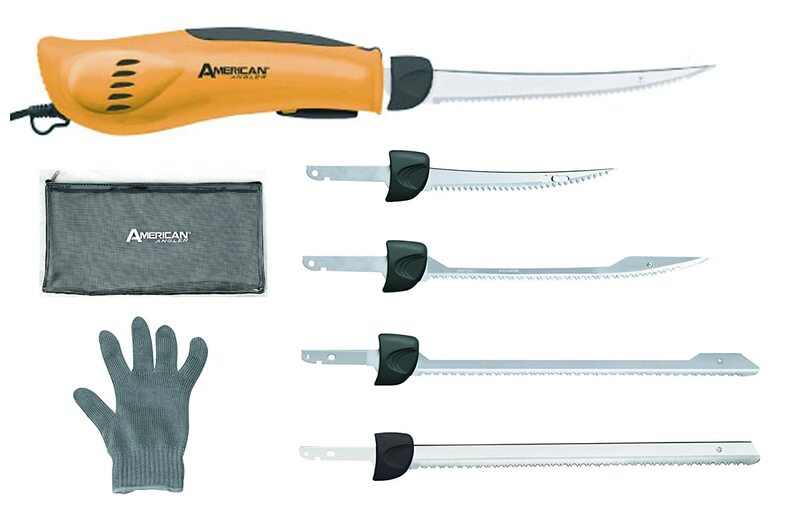 After consulting fishing enthusiasts, guides as well as well commercial fishermen about what would they want to see in an ideal electric fillet knife, American Angler has come up with PRO Professional Grade Electric Fillet Knife. One of the best electric fillet knife which you could purchase from today’s market, this knife is 2 times stronger as compared to any other electric knife on the market. This is made possible by the heavy duty motor inside this knife which makes filleting no less than a breeze. One problem which normally arises with an electric knife is that after consistent usage, the motor gets hot. In order to solve this problem, American Angler has integrated a vented air flow system with a fan inside it which boasts a hassle-free operation. This knife is compatible with a wide variety of blades as you can purchase it with 1 blade or with multiple blades as per your personal choice. For using this knife, you just have to plug it in with the help of 8-foot power cord, which comes along with this purchase, before pressing the button. Afterward, this knife will automatically find its way through the fish skin. In addition to such a high-quality knife, this purchase consists of a fillet knife set kit including a glove as well as a number of blades. All of these blades are of different types which make it a truly versatile product. However, the button mechanism which is used to turn on/off this machine seems not very durable. The American Angler PRO Professional Grade Electric Fillet Knife makes it extremely easy to cut through layers of meat in an instant. When it is a valuable product for any professional customer, it is extremely easy to use even for a newbie user. When it comes to best fish fillet knife, a lot of products are available in today’s market. Some of these products are perfect for personal use while others are designed to cater heavy duty applications. So while looking at the fillet knife reviews, it is imperative that one should consider the below-mentioned aspects of this purchase if he or she wants a decent return for their investment. Nowadays, a majority of manufacturers rely on stainless steel when it comes to creating the blade of a fillet knife. While choosing from one of these products, one should be critical about the type of steel which is used in the construction of that specific knife’s blade thanks to the different standards of this stainless steel. You should go for a fillet knife which incorporates a metal blade which is highly resistant towards corrosion. The flexibility of the blade is an important characteristic when choosing a fillet knife. Flexibility greatly affects the process of cutting fillets. In general, flexibility is determined by the thickness of the blade. The thicker the blade of the fillet knife, the less flexibility it has, and vice versa. Short blades should have increased flexibility because for the processing of smaller fish it will be necessary to make slits thinner, and turning the knife steeper. Longer blades should also have a certain degree of flexibility, but for them, this is not as important as for shortened blades. For bigger fish, such as tuna, one should select a knife with a considerable thickness. But if you’re dealing with smaller fish, go for the thinner blade. If you want to make a clean cut on a consistent basis, it is very important to select the handle of your knife with utmost care. The most common types of knife handles, which are constructed nowadays, ranging from wood to plastic and even rubber. When wood is fast disappearing from the handle’s material of construction, thanks to its slippery nature and ability to pick up the fishy smell, you should go for either plastic or rubber made handles. Many people overlook this part when it comes to purchasing a new fillet knife. But if you want to protect, the blade from damaging and yourself from an unfortunate injury, purchase a knife which comes with a sturdy sheath. A big proportion of knife-related accidents happens due to dull knives. When a person tries to exert a greater amount of force on any such knife to get the work done, he eventually ends up injuring himself. Moreover, a dull knife drastically reduces the lifespan of its blade. Hence, if you own a fillet knife or even any other kind of knife, consider investing in a decent knife sharpener. Thanks to the recent innovations in technology, a big chunk of rechargeable electric fillet knives have started to arrive in today’s market. When they save a considerable amount of time while cutting or chopping a fish, it doesn’t require much effort to work with such kind of tools. However, they are normally much expensive as compared to their manual counterparts. Last but certainly not the least aspect which you should consider before making this purchase, Budget plays an integral role in the choice of a fillet knife. When some people could spend a decent amount of money on this purchase, others would want to get it done within an affordable range. So depending on the customer’s bank balance, they should decide it as per their personal choice.